Get outside and get the kids excited! Enjoy 36 holes of fun for the whole family nestled amongst one of Perth’s premier garden settings. The 18-hole Garden course and the 18-hole Billiard Golf course combine to create Australia’s largest outdoor Mini Golf complex. Every track is uniquely shaped with its own obstacles, curves, ramps and challenges. 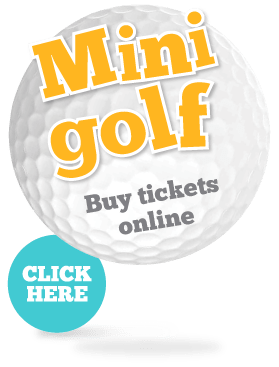 No matter what your age or skill level, you are sure to have lots of laughs and create many happy memories as you attempt to conquer the tricks and traps of our two great mini golf courses. It’s terrific fun for the whole family! Night Golf (Mini Golf in the dark) is open Thursday to Sunday evenings, with the last tee off time at 8:30pm. So suggest that date, grab some friends, or invite your family for a great night out. Pick up a light up LED golf ball or one of our Night Golf combos and make your game even more illuminating! Post game, don’t forget we sell fresh popped popcorn, mixed lollies, slushies and of course only the bestest, iciest, and tastiest gourmet Norgen Vaaz ice-cream.